Belle+™ is a small, easy to use shower-safe emergency alert pendant with fall detection and GPS and WiFi location technologies. It offers you the confidence to do what you love. Get help easily at home or away, anywhere in the US where there is AT&T coverage. Belle+ automatically connects to care specialists if it detects a fall. 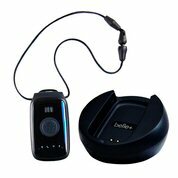 Belle+ can be located with GPS and WiFi location technologies. The rechargeable battery lasts up to 5 days per charge. A simple charging cradle makes recharging easy. Speaker - It’s easy to hear the specialist answer your call with this powerful speaker. Battery Light - A red battery light will flash to notify you that Belle+ needs to be charged. The light is solid when charged. Call, WiFi & GPS Lights - After you press the call button, a small blue light will alert you that your call is being relayed to a specialist. The blue WiFi and GPS lights will flash when Belle+ is being located. Microphone - A powerful microphone allows you to speak with a kind, courteous specialist. They can locate you and send emergency help or contact a loved one to assist. Try Belle+ today and enjoy the freedom and confidence to do what you love.